In March this year, Bristol will host the UK’s first, public 5G trial. The two-day live-trial – with Nokia and BT – will involve up to 5,000 people and is set to put the UK, and this city in the west of England, at the forefront of next-generation telecommunications. Bristol is home to a unique smart city platform – ‘Bristol is Open’ or BiO – that boasts a breathtakingly diverse array of cutting-edge communications technologies that companies can now experiment with, in a real-world environment, rather than in the laboratory. Formed by Bristol City Council and Bristol University, the venture integrates three networks: a sprawling optical network beneath the city centre, a mile-long region of heterogeneous wireless connectivity branching out from the core, and a RF mesh ‘canopy’ with access points dotted across 2,000 city lampposts. The rich fibre infrastructure comprises 144-fibre cables connecting four main active nodes with dynamic optical switching, while the wireless mile includes Wi-Fi, 3G, 4G and 5G network access, and even LiFi wireless connectivity. Meanwhile, the RF mesh canopy uses myriad wireless technologies connected back to the core fibre ring at nine points, extending connectivity for low-power, low bandwidth applications. All three networks – core fibre, wireless ‘mile’ and RF mesh – are linked to the so-called BlueCrystal supercomputer at University of Bristol’s Advanced Computing Research Centre where the information flows are analysed in real time. And the networks are also connected to Bristol’s 3D Data Dome planetarium, serving as a data visualisation facility (see panel ‘Hive of Activity’). Crucially, every single element across this diverse network platform will soon be controlled by software. The result will be a software-defined network that can be reconfigured at the click of a mouse; technology that, until now, has not existed beyond a data centre. 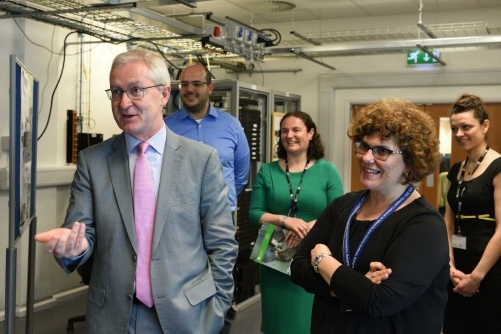 ‘Our platform is open for testing technologies, placing software, creating services and rolling out new solutions,’ highlights Professor Dimitra Simeonidou, chief scientific officer and the driving force behind Bristol is Open’s technology. For Simeonidou, the platform has been an absolute labour of love, and the 5G trials in March can’t come quickly enough given the last few years of research and innovation. ‘I arrived in Bristol about four years ago, and from the very first week we were talking about liberating the strengths of the city and doing something really transformative around the digital agenda,’ she said. On joining Bristol, one of her tasks was to design the platform, and optical fibre was the starting point. ‘It’s my belief that when you start with something new, you have to start bottom up, and having a good fibre infrastructure is fundamental to avoiding later bandwidth bottlenecks,’ she stated. At the time, Bristol already had a 76km-long fibre-optic network housed underground in a system of ducts owned by its council. The network had been developed by cable TV company Rediffusion, and then bought by the council to support its own telephony and data traffic network communications and CCTV needs. However, come 2015, the council leased the network to Bristol is Open, ready for Simeonidou and colleagues to begin their exciting project.